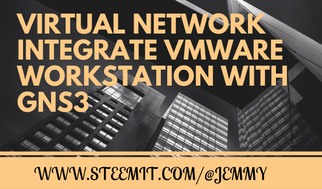 Here i will give you all the steps to integrate Vmware Workstation in GNS3 successfully. This is a process that I find particularly practical for the test phases, because it allows to link the system part, now widespread, in the virtualization network also virtualized. So we are working on GNS3 and Workstation 10 although the other versions of Workstation follow the same process. I'm assuming here that these two elements are configured and functional on your platform. In order to have a simple implementation, we will start by identifying the virtual network cards (you know, those that Vmware has created on your computer to link your VMs to your computer and then to the network) that we will use. So we go to our network card manager. Note: Renaming network adapters, even physical, has no impact on connectivity or network configuration of virtual machines. For those who want to make simple & clear and rename their network card, just right click on them to rename them.